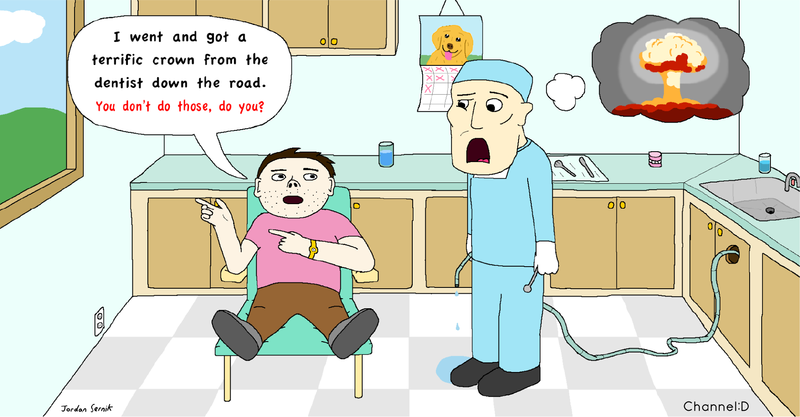 Has a patient ever said that to you? I remember the first time it happened to me. It was over 25 years ago, and I’m still scarred by it. A patient I’d treated on and off for a few years came in for a hygiene visit. She had six newish PFMs on her upper anterior teeth. I politely asked, “when were these crowns done?” The answer didn’t thrill me. “Dr (guy I hate most in the area) did them for me last year. You don’t do crowns, do you? I would have had them done here, but I didn’t think you did them”. I can’t begin to tell you how traumatized I was by that conversation. How had Dr “guy I hate most in the area” so successfully got the message out, that he was the “go to” guy for crowns? And how could my patient not even know that I did them? Back in those days, there was very little dental advertising in my area, so it’s not like his carrier pigeon spend was that much greater than mine. He was doing something right, and I was doing something wrong, and I couldn’t figure out what! Fast forward to now. It’s easy to get your message out if you’re willing to engage in an advertising arms race. I have to question, however, the wisdom of participating in the mutually assured destruction that is Google Ad Words. Out-spending is not out-smarting. There has to be a better way. The truth is most patients have no idea what we do. Think of your own general medical practitioner. Does he or she do vasectomies, or skin biopsies, or in-grown toenail removal, or implantable contraceptives? Sure you know they do the routine stuff, but if it’s anything a little out of the ordinary, unless you’ve needed it done yourself, you probably don’t know. And so it is with most people in your practice. They have no idea what ‘fancy’ stuff you do unless you tell them. And to make matters worse, if you’re like most dentists, you’re probably learning new procedures and techniques all the time. So how do you let all of your patients know about all the new, and rare (at least to them) services you offer? So where is the best place to spread information? It’s in your reception area, right in front of your patients. And how do you do it? With Channel D.
Channel D is a collection of silent videos that run on a TV in your reception area. They’re eye-catching, they’re entertaining, and they’re smart. Without even realizing it, your patients will become experts on all of the procedures you perform. Better than that, they will recognize when they, or a loved one, is a candidate for one of those procedures. The Channel D videos are personalized. The faces of the dentist and the team are featured in many of the videos. This has many benefits. Firstly, it proves Channel D is bespoke. It’s not just something off the shelf the dentist has bought. Most patients think it’s something the practice has commissioned on their own, and are very impressed. Secondly, and probably more importantly, the customization of the videos humanizes the dentist and team. Patients are a lot more scared than you probably realize. They’re scared of dentistry, and they’re scared of the dentist. Channel D videos make the dentist and team seem friendly, relaxed and likeable. And that relaxes the patients. Relaxed patients are easier to treat, and more likely to inquire about (and want) more complex treatment. Treatment they now understand thanks to Channel D.
There are over 100 videos on pretty much every topic and procedure you can imagine, with more being produced all the time. Many of our videos have been created as a result of ideas and requests from current users. Never again will I be traumatized by a patient getting something done (that I can do) somewhere else. My patients now know every procedure I do, and why they might want or need it. But Channel D is a lot more than that, and I’m really not doing it justice by trying to explain it in words. You need to see it to understand it. And after you see it, I’m pretty sure you’ll want it.